We are a group of people interested in discussing and learning more about global issues. Our members are retired diplomats and military, educators and attorneys, students and homemakers, to name a few. We welcome members from all walks of life whose interests may range from casual travelling to international commerce to sharing international perspectives. We need your support. We are a small, all volunteer organization with a modest budget. The majority of our funds come from memberships dues, and we rely on these dues to meet our program expenses. We appreciate our members' assistance in supporting our programs and keeping them free and open to the public. Membership is tax deductible. OWAC is a 501 (c) (3) non-profit organization. 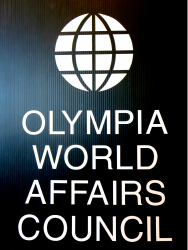 Click on "membership form," print and fill out the form and mail to Olympia World Affairs Council, PMB 712, 2103 Harrison Ave. NW Ste.2, Olympia, Wa. 98502 with your membership dues.